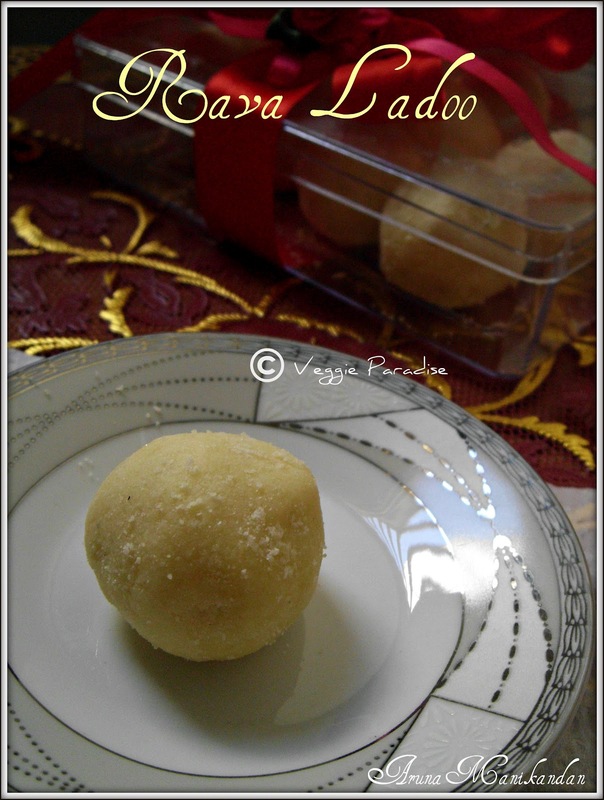 Rava Ladoo - This is one of the popular and simple sweet prepared during Diwali Festival.It is prepared with rava (semolina),ghee , sugar , cashew nuts and cardamom. There are different versions in preparing this ladoo and here comes my version. Now grind rava and sugar to a smooth powder using a blender. In a bowl , add the grinded powder, cashewnuts and cardamom powder. Melt and add ghee little by little and check if you can make balls from it. Take a small portion of the mixture and press it between your palms, to make a perfect round shape. Make sure you press them hard , or else they tend to break after some time. 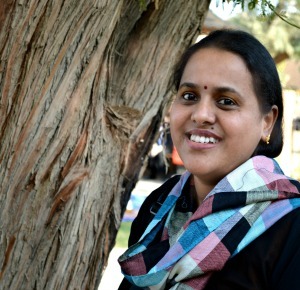 Roast the rava , in a low flame or else there might be chances for the rava to get burnt. While adding ghee to the mixture , make sure the ghee is warm and add little by little , gradually and check if you can make balls. lovely and perfect rava ladoo. Tempting and delicious laddu. Nice click. wow what a beautiful laddu...feel lik having it right now...yummm!! 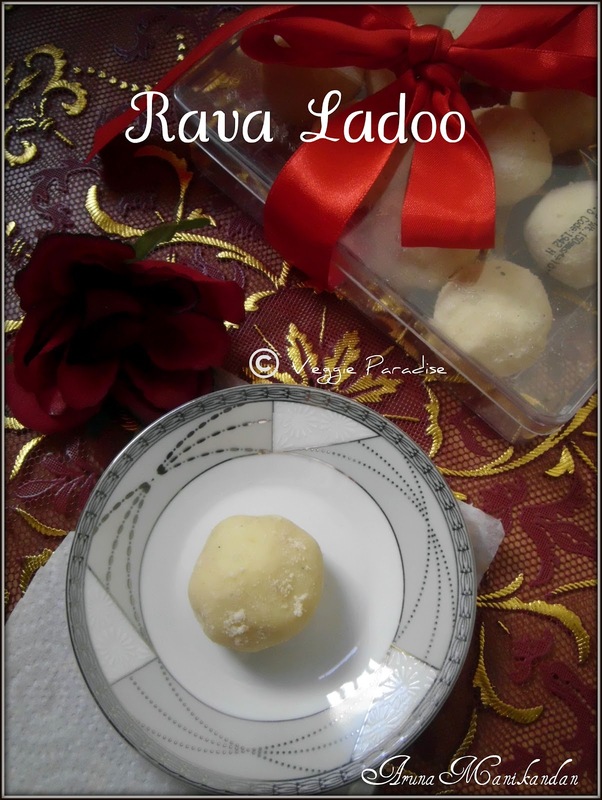 Rava ladoo looks yummy and delicious one !! Very nice smooth ladoos, I think this version has a longer shelf life.. Thanks for visiting my blogs very yummy ladoos glad to follow you ..
Ladoos look delicious. This is the first sweet i made for diwali, after wedding. Super tempting rava ladoo,looks so inviting. These are my favourite, looks super delicious. I have never tried grinding rava for this laddu! Looks soft and yummy! Tempting n delish-done Laddus Dear.Drooling here. Very beautiful laddu! looks delicious and inviting!! Do visit my space, Aruna. I have an award for you. My all time fav. Looks so good. Nice presentation. YUM! 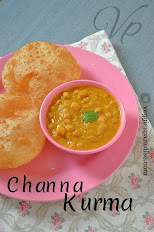 looks yummy, dear..one of my fav..